The Royal Adelaide Hospital (RAH) is Adelaide’s largest hospital with over 680 beds and will become even larger once construction for Adelaide’s new health and biomedical precinct is completed. Recently, A&D were engaged by the RAH to provide a custom weighing solution for weighing heavy liquids, waste products and general goods. 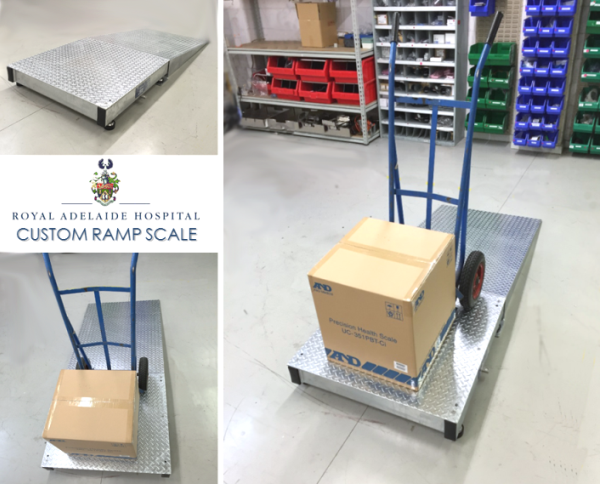 The platform ramp scale has a large capacity of 3000kg x 1kg and is manufactured from heavy duty stainless steel for easy cleaning and durability. The ramp is also angled at 7 degrees incline to ensure minimal chance of the liquid drums tipping over or spilling. This is another example of A&D’s weighing innovation and we are proud to be a part of this success story with yet another inventive weighing solution.